As India’s scuba divers get experienced and sophisticated, they are maturing to specialized adventures such as bioluminescent night diving, cave diving, volcanic diving and the recent popular trend – “wreck diving”. “Wreck diving” is a special form of a scuba diving adventure, where the diver explores a “shipwreck” sunk in the middle of the ocean. The thrill is seeing a ship that has lain undisturbed for decades - perhaps even centuries. A chance to explore what has been out of reach for so long. A shipwreck usually becomes a beautiful, artificial reef with a habitat for a diverse abundance of colorful marine life. It is also intriguing with some exciting or tragic history, often presents new skill challenges for diving, and is a microcosm of our maritime heritage. Wrecks may pose a variety of unique hazards to divers and extra care is required when moving and finning. Many divers are taught to use alternative finning methods and perfect buoyancy control is a must for diving in the environment of a wreck. Many diver-training organizations such as PADI provide specialist wreck diver training courses that teach skills such as air management and the proper use of guidelines and reels. A perfect example of an exciting wreck is the “Inket Wreck” at Duncan Island in the Andaman Islands. Inket was a Japanese ship that sank here in WWII. This is a direct, important clue for a little known historical fact about the Andaman Islands – that part of India was once actually occupied by the Japanese forces in WWII, and the Inket is a proof of Japanese entry into these waters in those historical times. When you are down at the Inket, you see the bow of the ship that rests on its starboard side with hatches and cargo hold clearly visible. An enormous propeller is the star attraction at the stern, which sits upright in 18m of water; and parts of the boilers and engine room are intact along with a second, spare propeller. Coral encrusts the ship’s skeleton, scorpionship make perfect camouflage and beautiful butterfly fish, trevallies, fusiliers, damsel fish and sea anomone with clownfish are abundant. Sometimes, a giant grouper and barracuda may make a surprise entry. The word around is that the 2004 tsunami straightened out the 70meter wreck that was lying on its side. This dive site is ideal for advanced divers, but sometimes conditions are suitable for beginner level divers too. Another, smaller but pretty wreck in the Andaman Islands is the MV Mars near Havelock Island. This is a small fishing boat that sank during a storm in 2006 and came to rest on the sandy bottom just off the reef, in 15m of water. The boat stands upright, fully intact and tilting slightly to the port side, with the roof of the wheelhouse rising up to 7m. This is a comparatively easy dive, ideal for students and beginners. 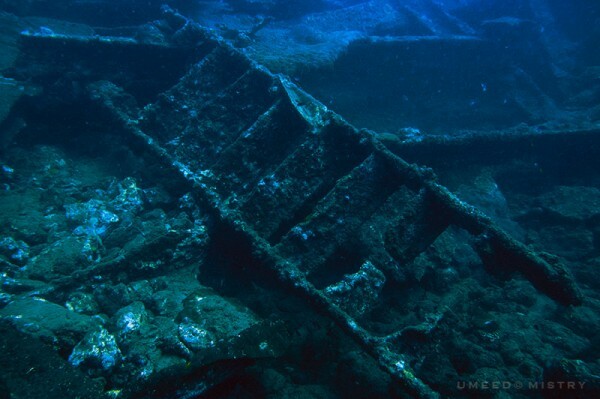 There are also wrecks in Goa (Suzy’s Wreck), and several off the coast of Tamil Nadu. Have a unique tryst with history, adventure & nature: A sunken shipwreck becomes an artificial reef, creating a habitat for many types of marine life. It also often has an exciting or tragic history. It is part of the underwater cultural heritage and may be an important archaeological resource and aviation archaeology, and provides a first-hand peek into historical context, a microcosm of our maritime heritage and maritime history. Finally, it presents new skill challenges for scuba divers. Travel to exotic, beautiful places in the world: Your quest for wreck diving will take you to exotic, beautiful places in the world such as the truk lagoon (chuuk lagoon) in Micronesia or some gorgeous Caribbean Island. Boost your health & wellness – There are many proven emotional & physical wellness benefits to going for an underwater adventure - it will be exhilarating, awe-inspiring, relaxing, calming, rejuvenating, fun and above all good for you!